Early results are in from the big SUP race in France this weekend: The €5,000 Massilia SUP Race in Marseille. After the big SUP Race Cup last week, this is the second weekend in a row that France has attracted many of Europe’s elite Stand Up Paddle racers. Once again it was BIC Sport’s Eric Terrien who took out the victory and in doing so extended his massive European winning streak. Terrien took out Saturday’s 8km Beach Race ahead of the Danish Viking, Casper Steinfath (Naish) with Gaetan Sene (Starboard) in third. Fanatic’s Olivia Piana continued her fine form to take out the women’s race, one week after scoring a clean sweep at the SUP Race Cup. 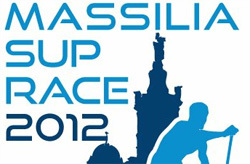 For a full race recap plus some action shots from the race, head over to SUP-Guide.com’s Massilia SUP Race review. Check out this great Massilia SUP Race recap vid as well. UPDATE: Eric Terrien made it two from two, taking out Sunday’s Long Distance Race ahead, while Gaetan Sene got some revenge on the Danish Viking, finishing 2nd with Steinfath 3rd.